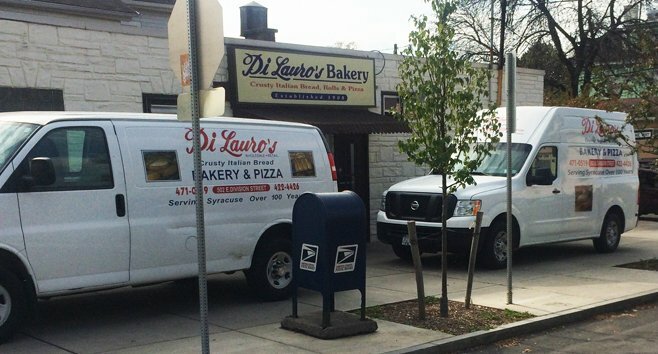 Di Lauro’s Bakery and Pizza has a wide selection of Italian artisan breads and rolls available every day at our Syracuse, New York, location. We carry a full line of Italian style bread as well as traditional deli rolls. If you need to place larger orders, we do act as a wholesaler for local universities, businesses, restaurants, pizzerias, sandwich shops and hospitals to name a few. We bake breads in a variety of sizes, including dinner, butter, and onion rolls. Our items are available for sale individually or by the dozen, and our Italian bread rolls are made in either a long, extra-long or round versions. Our deli variety breads for sandwiches, such as pumpernickel, rye, light rye, wheat and white are also available, as well as cinnamon raisin bread, all baked fresh daily. Our fresh-baked breads are also available with deliveries made seven days a week. We consider ourselves a bread supplier, so no order falls outside of our reach, and we supply everyone with a personal experience tailored to their needs. Contact us today with any questions or comments about our products. You can also visit our East Division Street location in Syracuse today!